Yesterday’s coup in Zimbabwe is of global interest. The country is one of the few that have long resisted the colonial “western” attempts to control its mineral and agricultural riches. Such coups are often driven by the CIA or other “services”. But there is no evidence yet that this is the case here. Local rivalry is for now the more plausible explanation. Since 1980, when Zimbabwe gained independence from Britain, the country is ruled by Robert Mugabe. He has run an anti-colonial and socialist policy. Unfortunately his economic policies, together with “western” sanctions and currency manipulations, have devastated the country’s economy. In 2000 Mugabe ousted some 4,000 white farmers who had owned and ran large estates. In a sweeping land reform the farms were split into plots and redistributed to local people. Agricultural productivity tanked and has since not fully recovered. A deep economic crisis with high unemployment ensued. Mugabe is now 93 years old and apparently frail. There has long been infighting over his succession. Mugabe’s wife “Gucci” Grace Mugabe and her children are well known for being exceptionally corrupt and prodigal when it comes to their personal amenities. 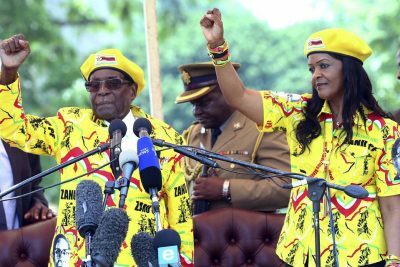 On November 5 Grace Mugabe asked her husband to be named as his successor. The ruling Zimbabwe African National Union-Patriotic Front (ZANU-PF) party is split in its loyalties to these two persons. The G40 “youth-wing” is following Grace Mugabe while the old guards of the party despise her. Yesterday the military moved into the capital Harare. At 4am this morning Major-General Sibusiso Moyo appeared on TV and announced that it has taken control. It denies that coup has taken place. In a statement the military “guaranteed” Mugabe’s safety and said that it was only targeting “criminals” around him. Mugabe and his family have been put under house arrest. There has been so far no fighting and no visible public opposition to the “non-coup coup”. Traffic and life in the capitol appears to be normal (vid). Obi Anyadike @Enugu62 5:02 AM – 15 Nov 2017This is all to do with stopping Grace Mugabe from taking over. The assumption is the military will keep Robert Mugabe on ice. Purge those around him. Bring back ex-VP Emmerson Mnangagwa from South Africa. And have him anointed at the ZANU-PF congress in December.